Last week, we were almost out of oatmeal. We had tried it from the End of the Commons General Store a few months back and decided to stock up. It’s not local (and I do have a lead on a bulk local quanity), but the timing was right for Sally and I to make a trip while Nick was in camp last week. 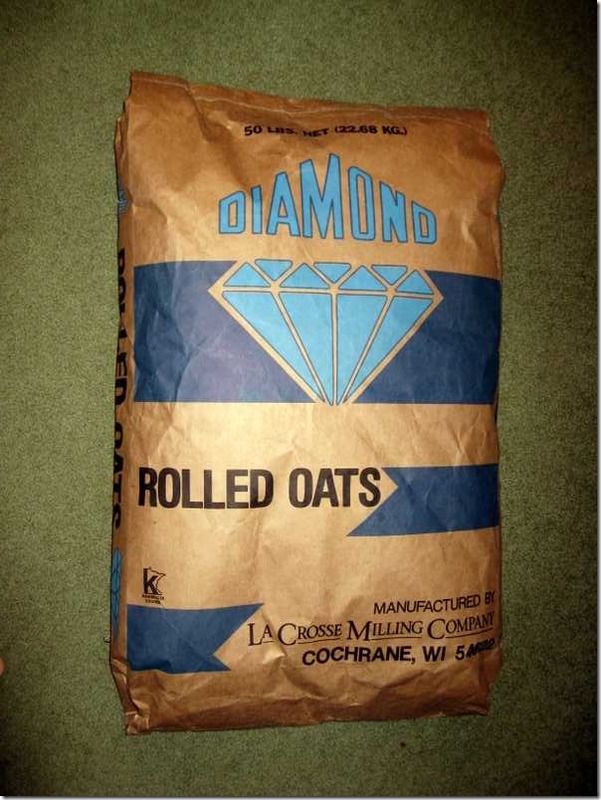 This is what a 50 pound bag of oats looks like. It was $26.00. 2 or 3 of us eat oatmeal for breakfast everyday. We also use it in some of our muffin recipes. I’m not exactly sure how long this will last, but I don’t suspect to need oats for a while. We bought a couple of containers from Dean’s Supply and bagged the rest. I’m hoping it stores well in Nick’s closest where the humidity isn’t too bad.